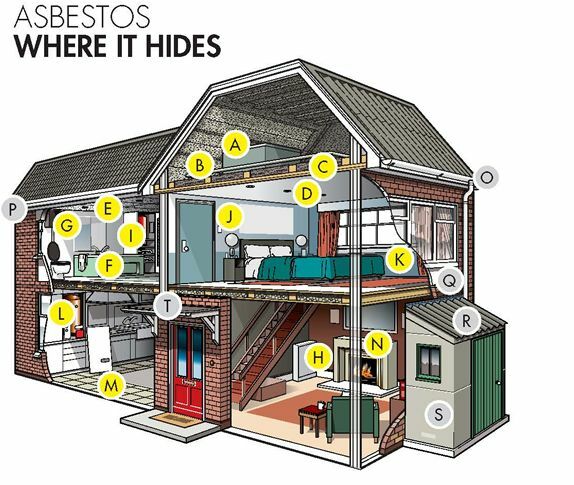 Asbestos is a proven health hazard that needs to be dealt with sooner rather than later, so don’t tolerate it in your home or property. Our fully-trained personnel will take the hassle out of hazardous waste removal for you. A to Z Waste Recyclers are ARCA qualified personnel with the equipment and the expertise to rid your property of this harmful building material which is banned by the European Union in modern construction. Asbestos is a proven health hazard that needs to be dealt with as soon as possible. Our fully-trained staff will remove your hazardous asbestos waste safely and efficiently. We can handle any scale of asbestos removal including asbestos sheets, cold water tanks, garages and asbestos cement. Health and Safety Executive (HSE). Often found in older properties (pre 1980). Asbestos insulation on pipes. Used to keep heat in or cold out. Often painted over or protected by outer coating so not obviously asbestos. Loose asbestos can be found as insulation in wall and floor cavities and in lofts. Can be found throughout property on ceilings and sometimes walls. Can contain asbestos-reinforced resin composite materials. Often found in hall or under stairs. Each fuse wire has an individual asbestos flash guard. Heater cupboard around domestic boiler often contains asbestos insulating board. Can be found as internal wall panelling both particularly around windows. Vinyl and thermoplastic floor tiles can contain asbestos. The tile backing may also contain asbestos paper. Roof gutters and down pipes can often be made of asbestos cement. Soffit board sits behind fascia at eaves level. Board can be made from asbestos cement or asbestos insulating board. Can be found as external wall cladding. For asbestos removal, we offer nationwide coverage. ... and other surrounding towns within a 25 mile radius of our headquarters (including Kent, London and the surrounding areas).